“Industry 4.0” is increasingly the term used to describe the sum total of developments in manufacturing and data exchange that will profoundly change the methods and machinery used to make things in future. Its proponents say that it stands for the Fourth Industrial Revolution. Detractors say it’s just hyped-up marketing to glamorise things that have already been happening for years. Whatever you call them, these trends are already changing the way we work. How will the printing industry respond? To explore these questions with a particular emphasis on large format working, FESPA UK has organised a seminar called “The Future of Print i4.0,” on 10 October at the Manufacturing Technology Centre in Coventry, UK. There are full details here: www.fespauk.com/i4print. The original Industrial Revolution started in the 1700s and was the cumulative effect of discoveries in metallurgy, developments of water and steam power, mechanisation of hand crafts, and the social changes that went along with them. According to Industry 4.0 proponents the second industrial revolution was, broadly, the adoption of electricity as a source of power (as well as light and heat), while the third came from the development of micro-electronics and computers. The term has roots in a German federal government initiative called Industrie 4.0, to promote computerisation across all manufacturing industries. In 2011 it set up the Working Group on Industry 4.0 which developed recommendations which it presented to the government and published its final report at the 2013 Hannover Fair. This defines Industrie 4.0 as a combination of four main trends: interoperability (people and machines working together plus the Internet of Things); information transparency (using lots of sensors to build up a big picture); technical assistance (a mix of data analytics to suggest future actions and mechanical systems to handle tasks that are too strenuous or dangerous for humans); plus decentralised decisions (the computers decide how to do tasks and then oversees the machines, with humans only needed to make decisions in unusual or unique cases). Today’s Industry 4.0 broadly groups together trends such as computer-aided manufacture, robotics, automated workflows, cloud-based computing and data sharing, the online linking of the ‘Internet of Things” of and the combination of artificial intelligence and data analytics to assess patterns and suggest improvements or predict failures before they happen. There has been less obvious talk about Industry 4.0 in the sign and display market that are primarily addressed by FESPA association members and the FESPA exhibitions. The more limited take-up of automation in large format inkjets for signage and mechanised screen printing appears to be a combination of the relatively low volume nature of large format printing, coupled with less of a culture of using the sophisticated management information systems (MIS) that are on offer. 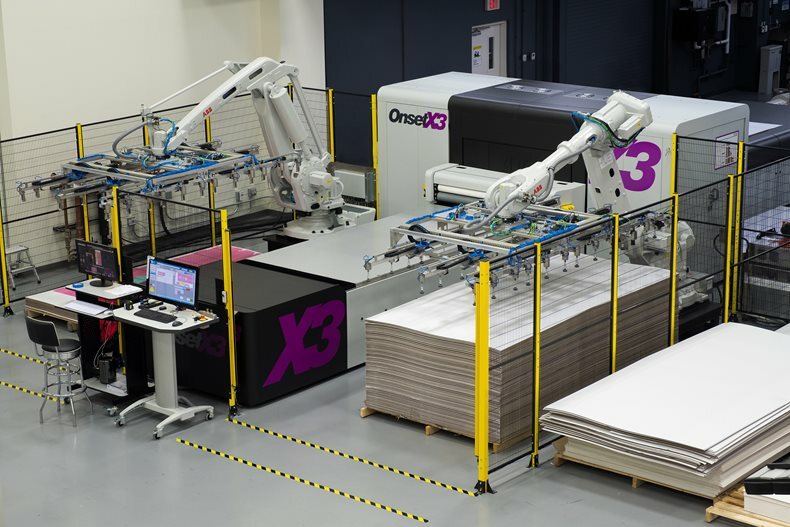 The main exception is robotics, an aspect of Industry 4.0 that is seeing increasing use for loading and unloading very large format flatbed inkjet printers and cutting tables. However, industrial robots have been around since the 1970s, so today’s move into print applications is more about increased affordability than then Industry 4.0 or Internet of Things. Caption: Esko Kongsberg makes this robot arm which gives great flexibility in loading and unloading its cutting tables. It links to the table’s IPC control software and in turn to Cloud based remote monitoring. In hardware terms, this particularly applies to loading and unloading very large sheets of board. Esko offers two systems. One is a sheet loader that operates at one end, with an unloading stacker at the other. This requires a belt on the bed to move the sheets along. The other system is a robotic arm that has sufficient reach to both load and unload, as well as to serve two tables side by side if required. This also allows twin zone working, which means the cutting head works on one sheet (or set of sheets) while the robot arm picks up finished sheets, deposits them onto the finished sheet palette, then reaches over and loads the next set of sheets in the vacated area. Robots are the most visible side of Esko’s automation work. “A lot of the development of robots has come out of our Value Stream Mapping, a service to our customers where we go in and analyse their working for waste, then we advise how to reduce this.” Waste in this sense isn’t just materials, but machine cycles, operator time and other inefficiencies. VSM looks at the whole job cycle, from design to print finishing, including production control and delivery. “It lets us learn from our customers what they need while they can learn to make their businesses more efficient. Steve Richardson, Sales Director and joint owner of Optimus, says “People talk about high levels of automation, doing all sorts of things with pre-press and post-press, yet they still copy their job sheets manually and do their invoices manually. It’s not rocket science, but a lot of people don’t do it. It seems that some bits of automation are seen as really clever and others are just boring! But those poor relations could actually transform the business. Inevitably the nebulous Cloud is involved, as a central repository for collected data from the Internet of Things. The Industry 4.0 aspect is that this can then be aggregated (many systems are added together and compared) and number-crunched by analytics programs to detect patterns and generate actions. According to suppliers and people who’ve tried it, however much you automate you will still need real people in the loop, to assign priorities, spot errors and anomalies, and to have the sheer intelligence and instant flexibility that computers and robots lack. FESPA UK’s former Director Peter Kiddell points out: “The human element is still important, combining understanding of people with the precision of computers.” Automation though, does the pattern-spotting, the repetition and the error-free data transfer, without getting bored, distracted or taking tea breaks. Does this this count as a true industrial revolution? Judging by the first one, we’ll know for sure in a hundred years or so.